Notice: I will not participate in Google Adwords certification program. I still offer adwords services but I found participating in adwords exam is kind of useless. First of all, I would like to thank you for visiting this page. I really appreciate it. Let me please introduce myself. I am the CEO & Founder of SEO Service Provider. We have launched our website in 2012 and since then we are growing rapidly. Currently we are one of the top adwords management companies in Bangladesh. Most of our clients are from your country! You can check “Clients Saying” section. To be very honest, I don’t like these terms: Google adwords expert in Bangladesh, Google adwords specialist in Bangladesh or Google adwords consultant in Bangladesh as I and my team are satisfying clients all over the world. In fact, we don’t have much local clients but our clients are mostly from abroad! 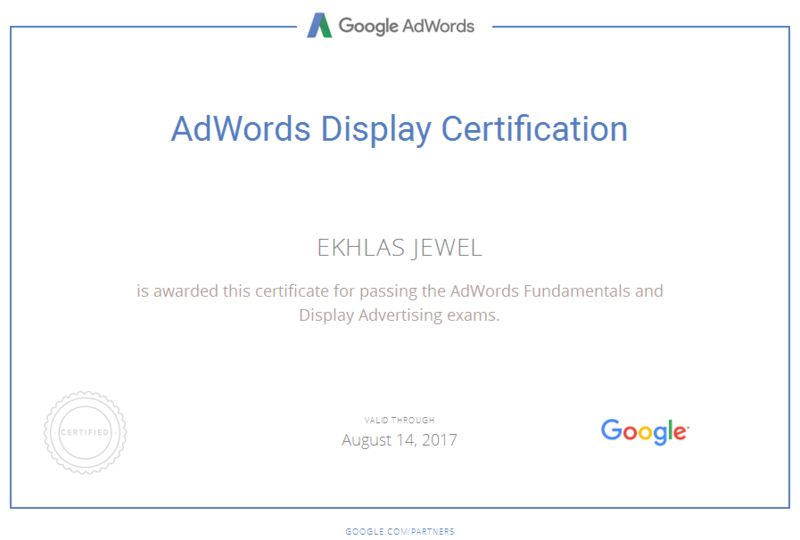 You don’t need to call me Google adwords expert or Google adwords specialist or Google adwords consultant yet. Please first verify my Google adwords certificate and then fix an appointment with me and ask whatever you have in mind about your campaign. After the conversation, I believe, you will get the feeling of my experience in adwords management and then you can call me adwords expert, adwords specialist or adwords consultant! That’s my personal certificate link. Furthermore, my company SEO Service Provider was a Google partner company! I am very good at search marketing! If you want me to set up Google search campaign then I would be very happy to do everything for you. That means I can set up your campaigns from the scratch. You just need to have a Google account and that’s it. I will do the rest that includes campaign setup, ad group setup, keywords research, ad copies creation, dynamic keyword insertion, competitor research, negative keyword analysis, cost analysis, ROI analysis and other critical things that you will learn from me! Do you want me to manage display, shopping or mobile campaigns instead of search campaigns? Don’t worry, I can also manage those campaigns. You just need to fill up the form below and I will get in touch with you shortly. Oh! I forgot to mention earlier, you need to setup your billing details obviously and I would really appreciate if you don’t ask me to setup your billing details. Though we were Google partner company and fully trusted but we don’t like to get your secret billing information! My campaign management charge depends on your monthly spending to Google. That means how much you are going to pay to Google for advertising, my charge depends on that. If you are paying Google more than $5000 monthly for advertising then you need to get a custom quote from me. Please provide as much details as you can in the message box. That will help me to get the idea first about your requirements. Thanks and waiting to get your message!